Atmospheric hexavalent chromium (Cr-VI), which is highly toxic and carcinogenic, is emitted from both anthropogenic and natural sources. Chromium is among the top five most abundant metals in diesel particles. Meadowlands district, which is located close to NJ Turnpike (NJTPK) with high truck traffic volume, may have elevated Cr-VI concentration. In addition, Meadowlands district is located ~5 miles from Kearny and ~ 10 miles from Jersey City, areas with more than 200 historic chromium waste sites. 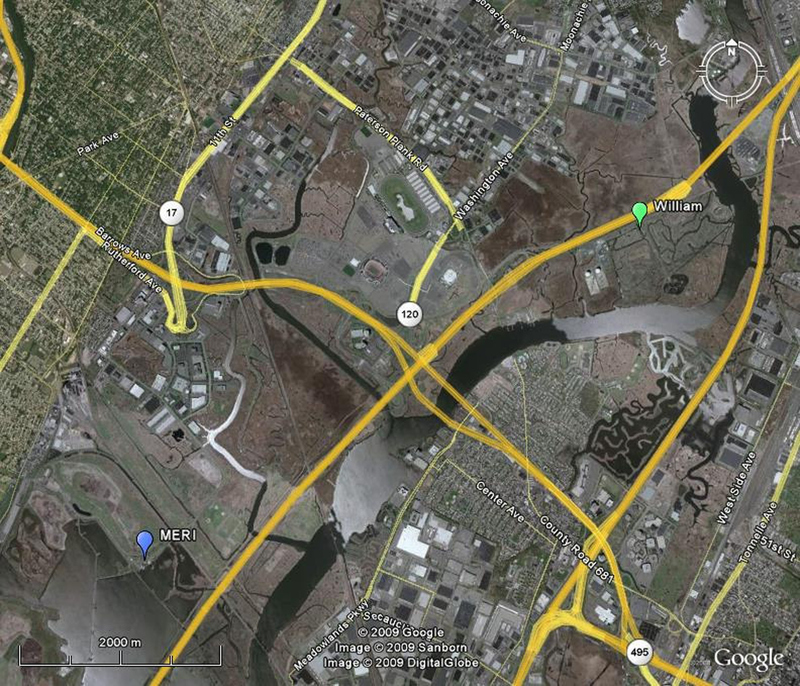 The Cr-VI contaminated fine particles may be transported to Meadowlands area and contribute to Cr-VI pollution. However, Cr-VI is not measured in air quality monitoring programs. Also, the detailed particle size distribution of Cr-VI in ambient air has not been characterized. The objectives of this pilot study are to determine hexavalent chromium air concentration and characterize particle size distribution in Meadowland district. In the one year pilot study, we will simultaneously collect PM2.5 samples at two sites: one on the roof of the MERI building, which is located ~ 700 m from the NJTPK (Figure 1), and one at the William site, which is located 50 m from the median strip of the NJTPK and 5000 m northeast of the MERI building (Figure 1). Sampling will be conducted 24 hours, from 8 am to 8 am next day for 2 weeks continuously in the summer and winter seasons. The Partisol 2000 Air sampler (Thermal Fisher Scientific) will be used to collect PM2.5. We will also collect PM at different size range (from 0.18 to 18 µm) using a Micro-Orifice Uniform Deposition Impactor (MOUDI, MSP) at the William site, and the sampling time will be 72 hours in order to collect enough mass for detection. The concentration of Cr-VI in PM2.5 as well as in different particle size fractions will be determined by a newly developed sampling and analysis method at EOHSI. The potential impact of diesel truck traffic on Cr-VI level in Meadowland area will be examined by analyzing the association of the Cr-VI concentrations measured at the two sites with the diesel truck counts of the NJTPK. The effects of temperature and humidity on Cr(VI) concentration will also be examined. 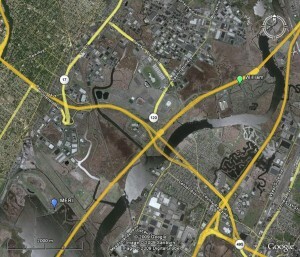 distant > 700 m from the NJTPK (obtained from Google Earth).